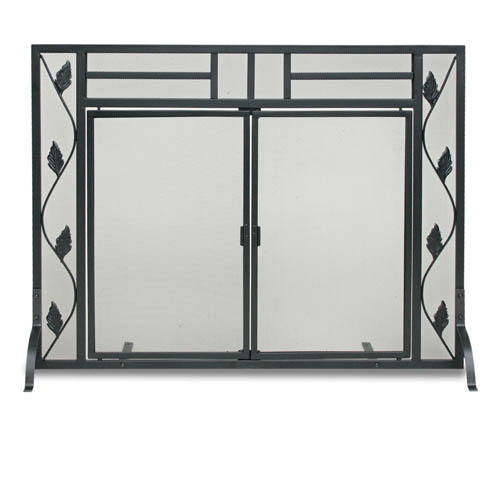 Simply satisfying and engaging elegance describes this Napa Forge fireplace screen with doors. The flat black finish goes with any decor, and the garden leaf design adds charm and appeal to a usual plain fireplace and hearth look. This Napa Forge screen is a single panel, but the doors are designed to open in such a helpful, handy way for easy access in the center. This screen is 38 1/2" W x 28 3/4"H.
What is this made of and how much does it weigh? Is there a warranty? This item is manufactured from mild steel tubing and weighs a total of 26 pounds. The Napa Forge product line offers a 10 year warranty against defects in workmanship or degradation of the painted finish.